Below is the recipe of how I made the crispy cheddar chicken. I served it with mash potatoes and corn. Ella even liked the chicken. So that is a win. 1- Preheat over to 375 degrees. Spray baking dish with cooking spray. 2- Cut chicken into small strips. 3- Crush cheese itz crackers in a sandwich side zip lock bag. 4- Add milk to a small bowl. 6- Line in order chicken, milk, cheese, crackers, baking dish. 7- Dip chicken in milk, then roll it in cheese, put in the back of cheese crackers and shake it. Then place in baking dish. 8- Repeat until all chicken is coated. 9- Top with remaining cheese and crackers. 11- Back for 20 to 30 minutes. 12- In a medium saucepan on medium heat combine cream of mushroom, sour cream, and butter. 13- Whisk until combined and warmed. 14- Once everything is finished plate chicken, and pour sauce over chicken. Next time I make it I won't be making the sauce. The sauce was really good, and worked out great on the mashed potatoes. 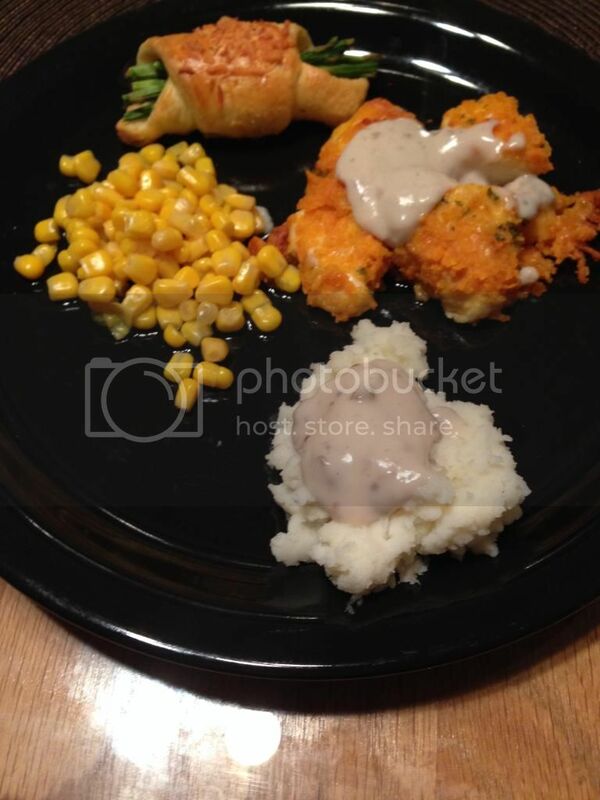 The chicken alone was very moist and flavorful that you didn't need the added sauce. I think it kind of overpowered the flavor of the cheese itz. Whats one of your favorite chicken recipes?